Please note: this site is still under development and more materials will be added as time permits. The purpose of this site is to make available some of the source materials that were used in researching the book Being and Becoming Kachin: Histories Beyond the State in the Borderworlds of Burma by Mandy Sadan (British Academy & Oxford University Press, 2013). Many of the materials have not been made publicly available before. It is hoped that providing wider access to them will help to generate further discussion on lots of levels: about the arguments and conclusions of the book; about how materials such as this can be used for historical research in particular; to extend knowledge and encourage debate about these materials among people directly affected by the issues described; to encourage more reflection by the academic community upon how we present our work and invite debate and critical engagement with the materials we use, especially when those materials are those to which we may have privileged access. The website is not intended to reproduce or replace the book but rather to provide an extension of it for wider reference. 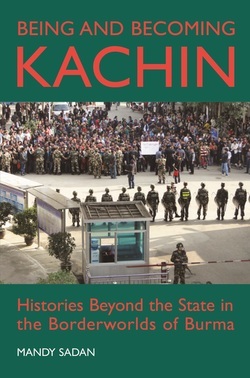 The intention is to make as much material available as possible to encourage debate around the wider issues raised in Being & Becoming Kachin at a critical time also in Burma's current political transition, especially concerning the distinct, yet interconnected, histories of so-called 'minority' communities with those of the 'majority'. The site includes the following: historical photographs; contemporary video, audio and photographic documentation of local rituals that are now rarely performed; comparative documentation of multiple manau festivals; translations of some materials into English as well as transcriptions into colloquial and/or ritual Jinghpaw; early research notes in which the effort was made to integrate knowledge about the historical materials and the contemporary documentation being researched collaboratively in Burma. All of these materials have been footnoted extensively in the book and here they are made available for further critique and reflection. Many are, of course, of great interest in their own right and it is hoped and anticipated that they shall develop a trajectory of their own. Some of the files are large and may take some time to download. The research underpinning this book was supported by many individuals, institutions and funding bodies between 1996-2013, of which the James Henry Green Charitable Trust and the British Academy were the most important. Critical to establishing firm foundations for the research was a period spent working on the rare audio-visual documentation that is presented here. A leading figure involved in making this documentation was Pungga Ja Li. The translations and other learning that I undertook could only have been done with the help and support of Hkanhpa Tu Sadan. Many young local researchers have persisted with the effort to expand on this initial set of materials in a sometimes very difficult, resource scarce environment since that time. It is hoped that this site, too, will encourage others to support these endeavours in a variety of ways. Rather than being an entirely 'stand alone' text, Being and Becoming Kachin represents a (still) ongoing effort to understand the complexity of the histories of this region and its communities, as well as how to represent and describe interlocking but heterogeneous and fragmented pasts. Being and Becoming Kachin is, therefore, part of a long and difficult thought process on these issues and it should be seen as an outcome of a number of interconnected ideas, projects and endeavours which have enabled the present conclusions to be reached. More details about the timeline of the research can be found in the relevant page on this site. The materials presented here are largely basic Research Notes. They are, therefore, in many respects quite raw, or at least unrefined. Polishing them would require even more time, and the funding to provide that time, so it seems better simply to make them available for discussion and information and let others take up the challenge of developing fresh, detailed knowledge about some of these issues, using this material as a stepping stone to further study.